Burnt Orange - The last days of Kyiv's "Tent City"
Days before Ukraine’s President Yushchenko was to be inaugurated in Kyiv, a core group of tent city denizens that eventually grew into the large street protests of the Orange Revolution, refused to remove their temporary abodes despite a direct request from the newly elected leadership. As the primary contributors to the success of the protests against the fraudulent elections, many believed that they were entitled to remain in the streets to the bitter end. That is to say, they wanted to have a front row seat at the inauguration itself. In the video (linked above), Lubomyr Kulynych takes us through the streets of the tent city, which by this time has become a rather seedy collection of dwellings lacking the warmth of the orange days when it swelled with the optimism of up to a half million protesters. 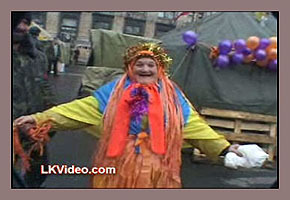 A highlight of the video is the “orange baba” who recites a poetic barrage of praise for Yushchenko and his government interspersed with diatribes against the losing candidate. The tents and streets were finally cleared on Friday January 21 -- just 2 days before the inauguration.